My oldest toon - 26 March 2009 gets a message "Unable to receive event title" I wonder why? When does this error occur? As you are receiving the present? As you open the box? As you attempt to equip the title? U can recieve the bday gifts only once per year,. so you prob already got urs. I tried on different servers too. 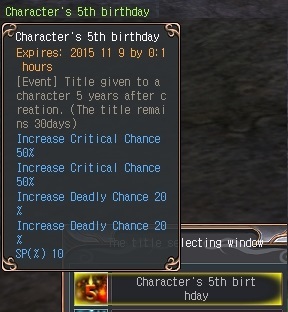 You likely already received the gifts on those characters. I will check on my archer though. Both of my archers received the boxes. One is from last year and the other is from 2006. 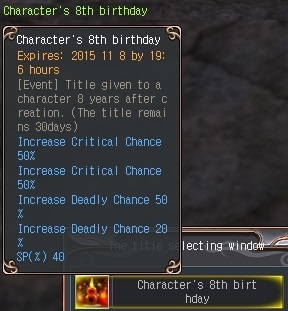 I received a gift on my archer when it was announced that the gifts were reset - 15 sp spells. Today Luda mentioned to go and check Estela again - My knight got his gift (title, 5xPBI and 5x SP spells). Not a big deal, but interesting what the seals on a 6-th birthday title are. 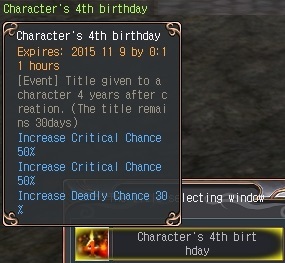 after it announced All Charater- Birthday gifts get reset. While we were down for the merge, we realized our birthday boxes were different than other versions and the issue was fixed. That is why it is 5 of each event item and the title. 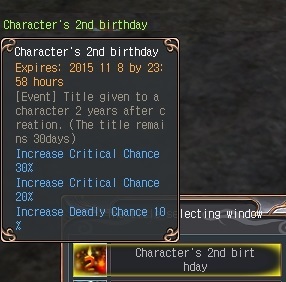 is it a one time gift or it will reset after the next birthday? you will only get the birthday gift for that particular year. This is another one of those things that has been active in ALL other versions for years and we did not get thanks to our previous publisher. Im curious about the sp seal on these titles... Does it work with quests , or its stackable with sp spells or other sp items? Death Knight quest gives 30,000 SP exp. With +40% from 8 year title : 42,000 SP exp. Another +40% from attendance set : 54,000 SP exp. So in other words, yes the title SP bonus works with quests, and so does the attendance set. how come i never got a birthday present? I bet u never met estella..
Not sure if that's still given out as a part of the system though, as there has been changes since that info was 100% relevant.